CALABASAS HILLS, Calif.--(BUSINESS WIRE)--The Cheesecake Factory® (NASDAQ: CAKE) is teaming up with its exclusive delivery provider, DoorDash, to give away $250,000 worth of free food on April Fools’ Day this year. This is not a joke… starting at 1:00 p.m. PDT (4:00 p.m. EDT) on Monday, April 1, the first 10,000 DoorDash customers who claim a reward on www.thecheesecakefactory.com/promo will receive $25 to use on a Cheesecake Factory delivery order any day that week*. Hurry, these rewards won’t last long. To get ready to participate, guests are encouraged to visit www.thecheesecakefactory.com/promo. As an added treat, DoorDash is offering a week of no delivery fees on all orders from The Cheesecake Factory beginning Monday, April 1, through Sunday, April 7, 2019**. DoorDash is The Cheesecake Factory Incorporated’s exclusive national delivery provider. 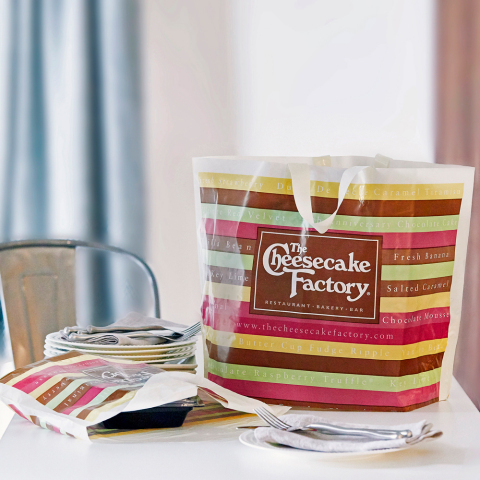 To find a complete list of delivery areas and additional information, please visit thecheesecakefactory.com/delivery. Customers who successfully Claim (as defined below) the Offer will be eligible to receive a $25 reward (“Reward”) to use on a future order at DoorDash from a The Cheesecake Factory restaurant in the contiguous United States from which DoorDash delivers (“Participating Restaurant”). To “Claim” the Offer, you must (1) have or create a DoorDash account, (2) log in to your DoorDash account from an internet browser on the device that you plan on using to Claim the Offer, (3) open or refresh, if already opened, the www.thecheesecakefactory.com/promo webpage (“Offer Page”) at or after 1:00 p.m. Pacific Standard Time (“PDT”) on April 1, 2019 (“Start Time”), AND (4) be one of the first 10,000 customers to click the “CLAIM FREE FOOD” link on the Offer Page at or after the Start Time while logged into your DoorDash account. The Cheesecake Factory is not responsible for any inability to Claim the Offer, regardless of cause, and will not provide rain checks or other 'make goods' in the event of any such inability. You must be logged into your DoorDash account from the same device and same browser as the device and browser that you use to access the Offer Page. See full terms here www.thecheesecakefactory.com/promo. Offer valid only for orders placed at DoorDash from a Participating Restaurant (as defined below) between 8 a.m. PDT April 1, 2019 and 11:59 p.m. April 7, 2019 (local time), or until delivery is no longer available from your Participating Restaurant on April 7, 2019. Offer will automatically apply at checkout when customer places an order via DoorDash.com or on the DoorDash app with The Cheesecake Factory locations in the United States and Canada from which DoorDash delivers (“Participating Restaurant”). DoorDash’s computer is the official date/time keeping device for this offer. No minimum subtotal required. Limit one per person. Other fees (including service fee), taxes, and gratuity apply. All deliveries subject to availability. Must have or create a valid DoorDash account with a valid form of accepted payment on file. No cash value. Non-transferable. See full terms here www.thecheesecakefactory.com/promo. The Cheesecake Factory Incorporated created the upscale, casual-dining segment in 1978 with the introduction of its namesake concept. The Company, through its subsidiaries, owns and operates 218 restaurants throughout the United States, including Puerto Rico, and Canada, comprised of 201 restaurants under The Cheesecake Factory® mark; 14 restaurants under the Grand Lux Cafe® mark; two restaurants under the RockSugar Southeast Asian Kitchen® mark, and one restaurant under the Social Monk Asian Kitchen Mark™. Internationally, 22 The Cheesecake Factory® restaurants operate under licensing agreements. The Company’s bakery division operates two bakery production facilities, in Calabasas Hills, CA and Rocky Mount, NC, that produce quality cheesecakes and other baked products for its restaurants, international licensees and third-party bakery customers. In 2019 the Company was named to the FORTUNE Magazine “100 Best Companies to Work For®” list for the sixth consecutive year. To learn more about the Company, visit www.thecheesecakefactory.com.